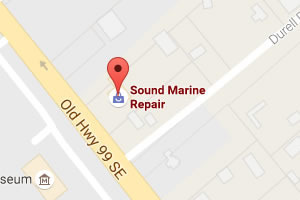 Sound Marine Repair specializes in outboard engine repair. We service all the major names as well as any type of outboard engine you have, old or new. Our modern facility has the best diagnostic and repair tools to repair your engine quickly, so you can get on the water for more boating fun! Call or stop by for factory authorized outboard engine repair in Olympia. We are conveniently located right on Old Highway 99 near Olympia Regional Airport. When you come to us for outboard engine repair, we offer upfront, honest communication. We give you a full report on what we found and take the time to explain it. You will never get hidden fees or pressure for services you don’t need. You get honest diagnostics and straightforward suggestions. All our parts and labor come with a 90-day guarantee, and we are licensed, bonded, and insured so you can feel confident in the quality of the repair. We are a locally-owned, second-generation company who has provided marine repair since 1973. We are invested in our Olympia community and care about doing a good job. We stake our reputation on the quality of work we do, one boat at a time. That is why we hand-select our technicians for their depth of experience and expertise in boat repair services. We care about getting each detail right to keep your boat’s engine running at its most efficient. Whatever size or type of outboard engine you have, we can fix it! We also carry a large inventory of engine parts in our storefront. Come by and talk to us about your outboard engine repair needs in Olympia. Call now for superior service and outboard engine repair in the South Sound area.